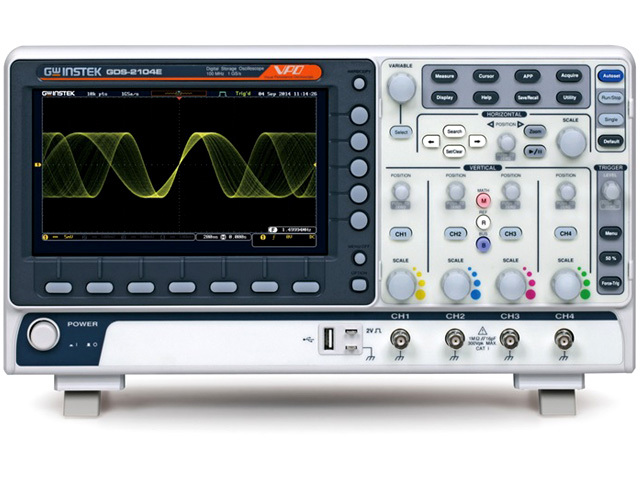 TME has introduced 6 GDS-2000E series oscilloscopes from GW INSTEK. They offer large memory that allows you to record up to 10 Mpts, which enables detailed analysis of captured runs. The oscilloscopes come in 2- or 4-channel version, with bandwidth of 70, 100, or 200 MHz (depending on a particular model). They are equipped with a large, 8-inch 800x480 TFT LCD display. Maximum vertical resolution of 1 mV/div allows you to see even weak signals and slight changes. The real-time sampling rate is 1 GSa/s per channel for 2-channel models, and 4-channel models of the series provide 1 GSa/s max. real-time sampling rate. "Zero" button enables instant resetting of horizontal, vertical, and trigger settings.